worked with us in the past. We are proud of our 5 star ratings! In regards to my recent condo purchase with Danielle O’Brien; I have known Danielle for several years now. When the time came to start searching for a property, Danielle was the only person I could imagine starting this process with. As a first-time homebuyer I reached out to Danielle to discuss my options, what kind of position I should be in to purchase etc. Danielle made herself quickly available, provided me with great information, advice and contacts. Danielle noted what I was looking for, began proving me listings that fit my criteria and was very accommodating to any changes I made in my criteria along the way. Several months later I received a listing I found to be perfect and immediately replied to Danielle. That same day Danielle was able to secure a private showing and we had my offer accepted the following morning. Throughout my experience I found Danielle to be very professional, knowledgeable, attentive and downright awesome at what she does. She was there for me every step of the way to answer all of my first-time homebuyer questions and I truly couldn’t have done it without her! I would highly recommend Danielle to anyone! “You should absolutely consider Parkway Real Estate, when selling or purchasing a home. We took the first time home buyers class at Parkway RE and felt very sure of the process. From that class we also knew that we wanted to work with Parkway RE when finding our first house. 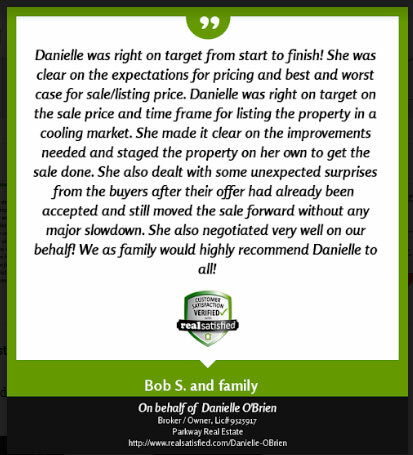 Danielle goes out of her way to make sure you have a positive, reliable, relatable and honest outcome! I’ve heard some horror stories and am shocked that anyone would put up with unprofessional, aloof agents. We adore this company and plan on sending anyone looking to buy, sell or rent to Parkway RE. It’s rare to find a company with such integrity and professionalism! “I can’t imagine working with anyone other than Parkway Real Estate. We bought our first home with the assistance of Danielle and right from the beginning she was never pushy yet she always had a game plan according to OUR needs not hers. She is patient, honest, and keeps her views objective when you as the customer may become too emotional.